They’ve been around for quite some time and, to no surprise, they’re not going anywhere any time soon — except for flying around, of course. Drones began to enter the national spotlight and push their way into the layman’s vernacular in the late 2000s or early 2010s (is that what we’re calling these decades?). What was once relatively secretive military technology is now our method of grocery delivery. Difficult and often-dangerous jobs are now replaced with unmanned aircraft. You can even prank people with drones. So, while it should come to no surprise that drones are incredibly ubiquitous, we love talking about them on Jonathan The Drone Guy’s blog. After all, Jonathan is the drone guy, acting as your source for a Los Angeles real estate drone expert. Helping realtors market their listings and stand out from the crowd, he’s also able to capture your wedding, shoot your music video, help survey your construction site, and much more. To help illustrate Jonathan’s passion for all things drone-related, here are a number of interesting drone uses. 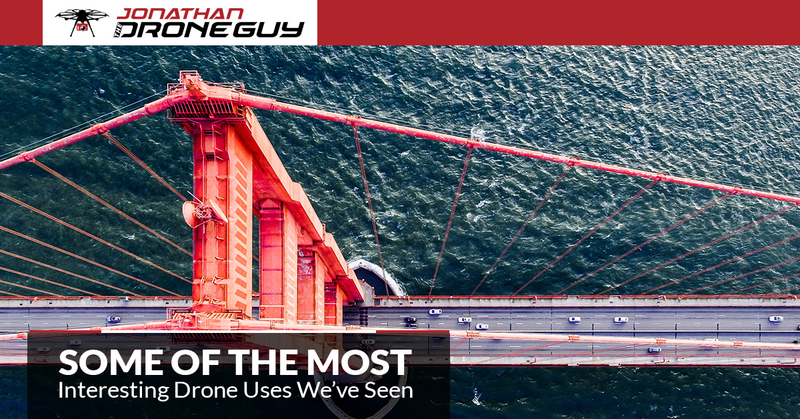 Jonathan himself is no stranger to using drones to capture amazing shots, but it’s pretty crazy when you think about some of the places that drones are able to safely access. From the heights of 20,000 foot mountain peaks to the top of the Burj Khalifa, drones can easily get to places that are otherwise unsafe for humans. No longer do we have to put our lives on the line just for a breathtaking shot. Yes, drones can clean windows just as well as human window cleaners. While this supports robots effectively taking over the world, there’s no doubt that an unmanned aircraft cleaning a high rise window is a lot safer than a human doing the same job. Sure, a pile of broken drone equipment is sad, but it pales in comparison to the loss of a human life. Wind turbines rise hundreds of feet off of the ground, and due to their free standing nature, they’re quite difficult, expensive, and risky to clean and maintain. Drones eliminate the safety risks associated with wind turbines. It’s true that cleaning and defrosting wind turbine blades is an act of routine maintenance, but now turbine workers won’t have to put their lives on the line just to get the job done. Viewing wildlife (from a safe and respectable distance) is often a humbling experience that fills us with a sense of wonder. However, human intervention often disrupts the natural environment for wild animals, and even results in injuries — or worse. Drones have made it possible to easily and safely monitor the behavior and migration patterns of wild animals, as well as capture their actions with photographs and video. Though there are many uses for drones, Jonathan’s goal is to help you actualize your dreams with the help of his drone photography and drone video services in Los Angeles. If you’re local to Southern California, he can help! Contact Jonathan The Drone Guy today to learn more.